HGTV host and designer Sarah Richardson is famous for mixing patterns in unexpected ways — but she takes a less-is-more approach in this dreamy spa bath where the room’s big punch is provided by alternating bands of watery blue and green glass tile on the shower’s accent wall. Keeping the more modern touch small helps it blend seamlessly with the otherwise traditional bathroom. Designer Mark Williams makes the slipper tub the star of this luxurious bathroom by tucking it into a tile-covered arch beneath an oversized Palladian window. Larger 9 x 18 Carrara marble tiles surround the window while smaller marble subway tiles line the arch. To complete the traditional look, Mark chose Cararra marble and black granite basketweave tiles for the bathroom’s floor. 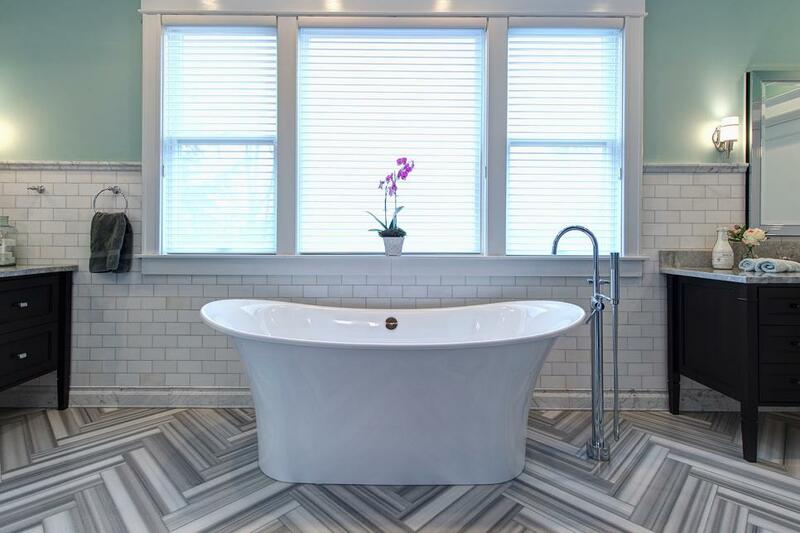 Although you might mistake the herringbone floors in this posh bathroom for wood or even a painted detail, it’s actually marble that designer Joni Spear had painstakingly cut into 4-inch-wide planks then laid in a specific order to maximize the color contrast between different areas of the stone. This modern and uber-hip small bathroom, designed by Brian Patrick Flynn, is full of outside-the-box ideas. From the graphic pattern on the door, created by attaching cut wood planks, to the mosaic tile accent wall that Brian added to both brighten up the vanity area and make the walls feel taller. San Francisco Bay-area designer Kriste Michelini uses tile to create a divide between the wet and dry areas of the bathroom. She frequently experiments with unique combinations of tile and uses various tile shapes in the same marble material to create a sense of infinite space. Portland, Ore., designer Jessica Helgerson believes the little tiling details can make or break a space. For example, she finds it’s important to carefully consider where the tile starts and stops. If there isn’t a clean way to end the tiling, she’ll often take the tile all the way up the wall. This bathroom features one of Jessica’s favorite tiles, made by Oceanside GlassTile. For this small bathroom, Kriste Michelini creates a luxurious hotel feeling by keeping the floor and wall tiles the same. The entire space is wrapped in a black tile that’s offset with a wall-mounted vanity. When tiling a shower, Kriste Michelini suggests putting the shower niche on the same wall as the shower fixture. This allows for the main walls to be tiled beautifully with no disruptions or cut outs in the focal wall. In addition, she suggests continuing the bathroom floor tile over the shower curb and into the shower pan to visually expand the floor and keep it clean looking. In this bathroom, the client wanted a beachy vibe, so Kriste uses a mosaic tile on the walls with small white subway tiles on the shower pan. The bottom third of the shower door is frosted for privacy while the top is left clear to allow natural sunlight into the shower. Charleston, S.C., designer Cortney Bishop prefers to use one tile for the entire space as a way to create a cohesive look. If the scale of the chosen tile is too large to use everywhere, Cortney cuts the chosen tile down to scale to maintain the continuity and then creates a spa-like feel by taking the tile all the way to the ceiling. 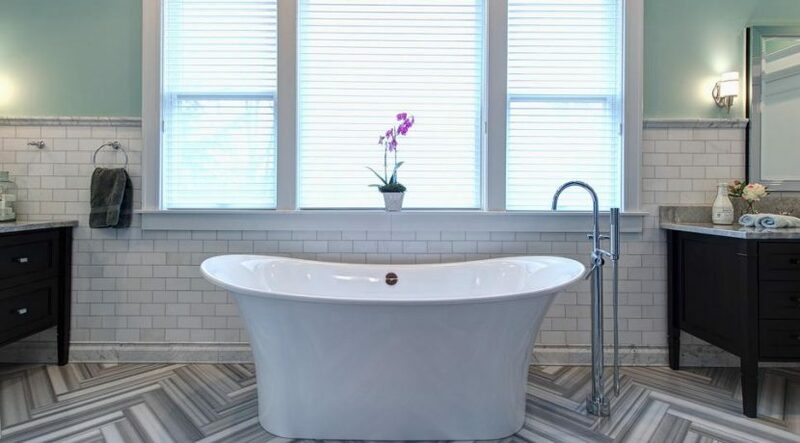 Jessica Helgerson utilizes Dal tile in a 3 x 6 white brick and chooses a thinset rather than a thicker setting bed. For added detailing, she drops the ceiling around the sinks to create a little niche that is completely covered in tile. The floor is a limestone hexagon pattern that came with more variation than she expected but ended up adding a lot of visual interest. In this modern bathroom, the ceramic tiles are installed vertically to emphasize the geometry of the space and give the illusion of height. Also, by combining different tiles in similar colors, you further emphasize the size of the space while creating a sense of visual texture.